Thanks to everyone who participated in Margaret Atwood Reading Month and contributed their enthusiasm, interest and experience to making the event a success. We’ve collaborated on this link collection, so we’re cross-posting. Please let us know if we’ve missed anything and we will transform all the information into a page that we can update for future MARMs! Straight away, after our announcements on October 1st, there was talk of plans and excitement. Bookish Beck made plans quickly. And Angélique chatted about just beginning her Atwood exploring (with The Heart Goes Last and Alias Grace). 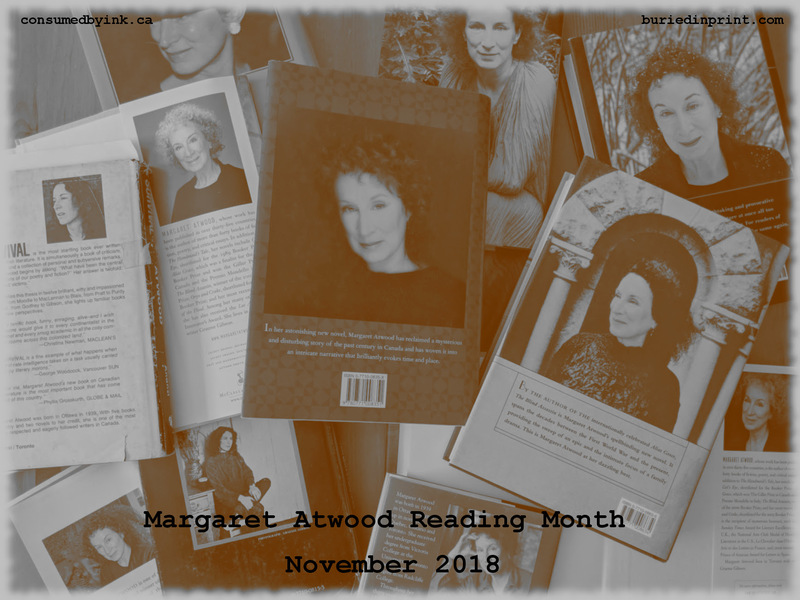 Paula Bardell-Hedley reminded readers every week through October of the event and then crowned the promotion with her Margaret Atwood Shelfie and, later, some of her favourite covers. Heaven Ali and Karen shared some of their favourite covers too. And so did I, along with my favourite quotes (which Paula had fun with as well). Madame Bibi titled her review post (see below) with one of her favourite quotes (you’ll have to click through to discover what it is) and Anne on the Shelf tweeted a timely quote for November as well. Many readers shared their first experiences. Some, like A Life in Books and HeavenAli and Karen and Marcie, found it hard to pinpoint the specific book which twigged their interest in the late ‘80s. The classic Virago Modern green-spines or one of the chunky pocket books? Was it The Handmaid’s Tale, Surfacing, Lady Oracle, The Edible Woman, Bluebeard’s Egg, Cat’s Eye or Bodily Harm? Others specifically recall their first Atwood. For Kat and Debbie it was The Edible Woman. For Rebecca and Lisa, it was The Blind Assassin. For Laila, Cathy, and for me it was The Robber Bride. Those who read and reviewed during the month included classic and contemporary selections and even some children’s books and poems and a cookbook! Surprisingly, nearly every work of fiction came up in conversation or was reviewed during the month. This was Rickster Rick’s introduction to Atwood and a favourite of HeavenAli’s. Out of those who commented or posted, for the majority of Atwood readers this was their first of her books. Including Anne, Paula, Kristie, Kristine, WhatMeRead, Vishy, and Lory. For Rachel @ Hibernator’s Library too, who writes about it here and here. And Iliana @ Bookgirl, and Reese @ ReeseReads (who made it fit with some challenges too). This was Priscilla’s introduction to Margaret Atwood. And Melanie had just announced she was going to read it in October when she saw the announcement about MARM. This was my first Atwood (and Cathy and Laila said that it was their first of her books too). This was Melanie’s introduction to Margaret Atwood. Also, Yasmine Rose wrote about the trilogy as a whole (see below). But of course, Margaret Atwood writes a lot of different forms, so there was also more to say about her children’s books (from 1978’s Up in the Tree to 2011’s Wandering Wenda and Widow Wallop) here (by Thoughts Become Words) and here (by me). Kristie read some short stories. I peeked into her poetry and, would you believe, a cookbook?! And Marcie held a discussion about readings, interviews and TV adaptations. Finally, because the event unfolds in November to celebrate her writing and her birthday, there was also cake, at Laila’s house and at mine too! Now for those of you who missed their slice of cake on the 18th, you’re lucky that we tossed a few leftover slices into the freezer. Grab a plateful and start thinking about what Margaret Atwood book you might like to read next! Now there’s a great page to bookmark, so many reviews of one author all in one place. Well done! It’s nice that there’s such a wide variety! I am so sorry I didn’t manage to participate this year – I managed about two chapters of Oryx and Crake before life got in the way! I have loved reading everyone’s posts and I do hope it comes back next year – maybe we could all read The Testaments! We were wondering about that very thing, Cathy! Ooh, it’s going to be annual?! Exciting! I’m most keen to read The Robber Bride next year. Now to see if I’ll fit in any more MA before then. I think we’re going to attempt it, yes! And look at you, already making plans – I love it! Splendid event, ladies. It’s obviously been a great success. Thank you for the links. 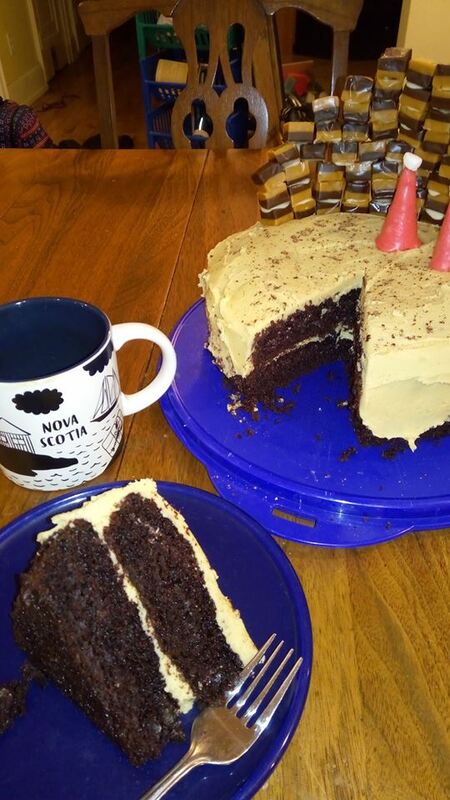 Here’s to Margaret Atwood and cake! I liked Oryx & Crake so much that I taught it circa 2015 (something around there)! I love this event. Thanks for doing all the rounding up of links and thoughts. Quite an undertaking! I hope to participate again next year! Thanks for the mention and a really great month hounouring Ms Atwood, reminding me of so many great books. I particularly loved the quotes, and that cake looks splendid! Thanks, Susan! It was a lot of fun! Well, I completed the reading part before the end of the month but never made it to the writing. I’m sorry. I finished The Handmaid’s Tale and was stunned by the story and how it made me feel. What a great event. I’m going to try harder to participate next year! Thank you so much for hosting this and am so sorry I didn’t get to participate more but November was just a bit crazy. 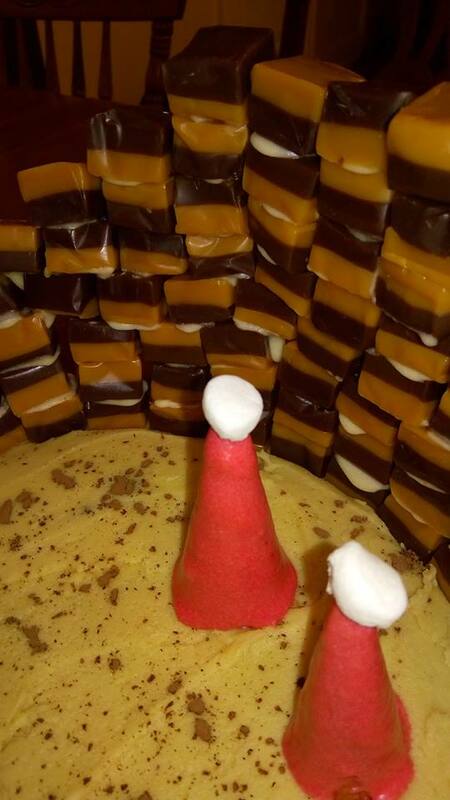 That cake looks yummy and now to look forward to the follow up to The Handmaid’s Tale right? What great news from Margaret Atwood! No need for apologies! It’s all just for fun. So glad to have you join in for whatever you can! Her new book is going to be out just in time for MARM next year! What a wonderful idea for a blogging event, and I’ll repeat myself once again, I loved the acronym! Atwood would most certainly approve. Did someone tweet at her during November to let her know what you guys were doing? Did she acknowledge it in any way? I tagged her on her birthday when I tweeted a picture of the cake I made. But, as far as I know, there hasn’t been any acknowledgement of the event. I imagine she gets a lot of tweets! Maybe next year! hmmm true, maybe she just hasn’t gotten to it yet? Heheh Maaaybe I will still post it. Funnily enough, I hadn’t even been planning to reread this one, and was actually enjoying the idea of floating around and through a bunch of shorter pieces and introductions and interviews. But then I found a second-hand copy at a booksale which was the same edition as I’d read as a teenager so I was in. But the post? We’ll see. If so, you can be certain it was your vigorous nodding that did the trick!